November precipitation ranged from 125% of normal to more than 200% of normal for most areas. 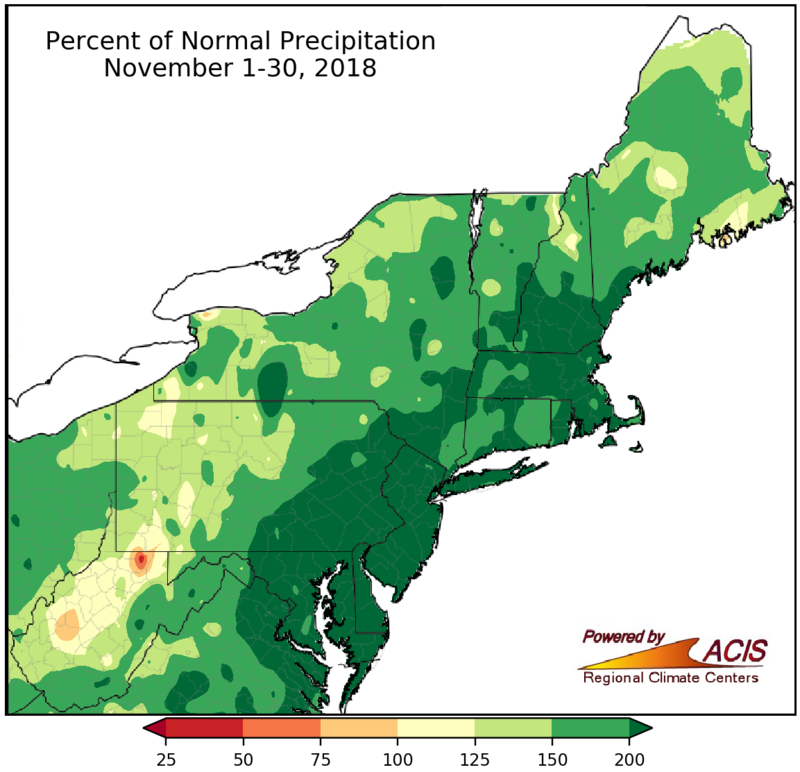 It was a very wet November for the Northeast. Seven major climate sites had their wettest November on record, and another 16 sites ranked this November among their five wettest. Twenty major climate sites received more than double their normal November precipitation, with two sites even seeing triple! 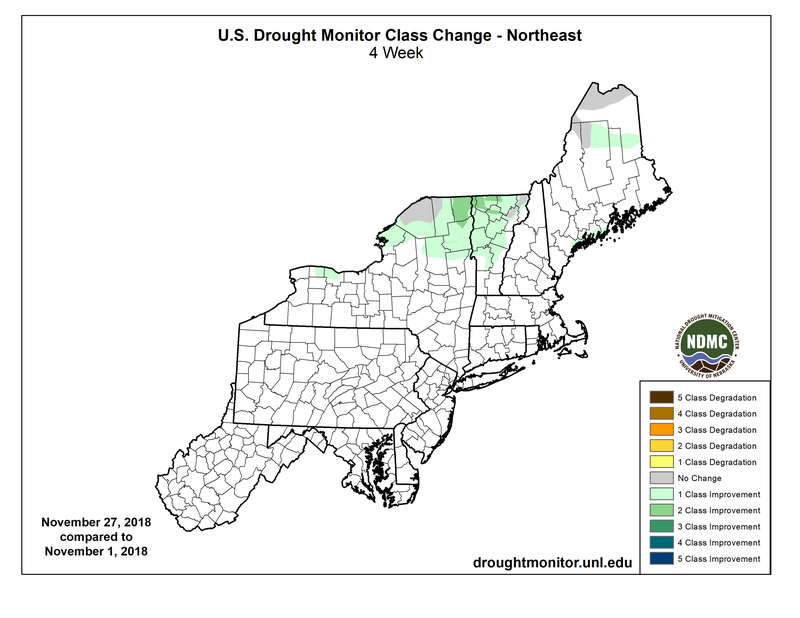 The wet weather allowed drought and abnormally dry conditions to improve in northern New York and northern New England, with the region becoming drought free mid-month. Seven major climate sites had a record wet November (shaded yellow). Autumn precipitation ranged from 100% to more than 200% of normal. 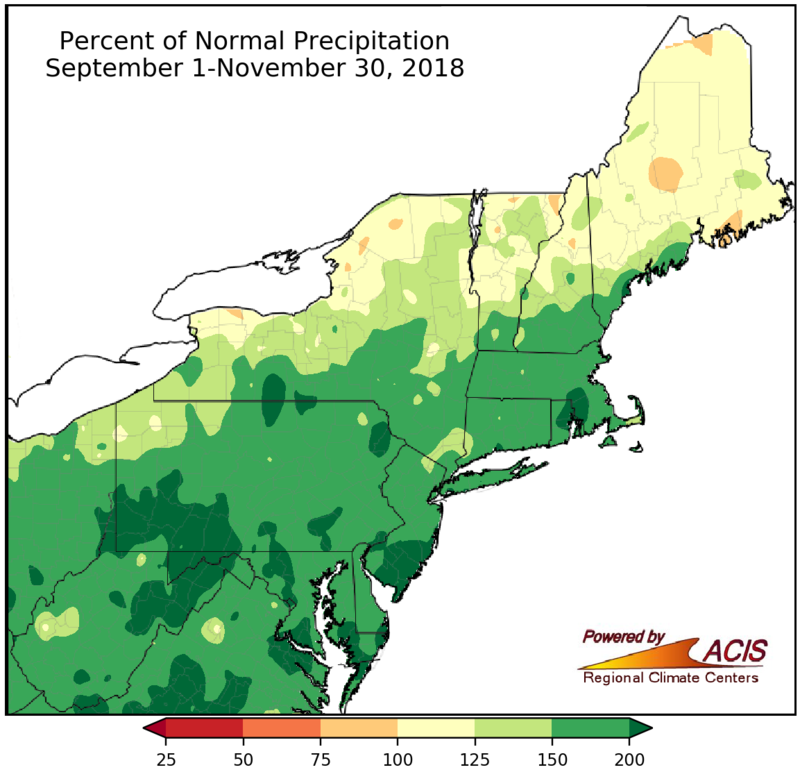 The autumn season also wrapped up on the wet side of normal for the Northeast, with the wettest areas seeing more than 200% of normal precipitation. Ten major climate sites had their wettest autumn on record, and another 13 sites ranking it among their five wettest autumns. Ten major climate sites had a record wet autumn (shaded yellow). Average temperatures for November ranged from 2-6°F below normal for a majority of the Northeast. 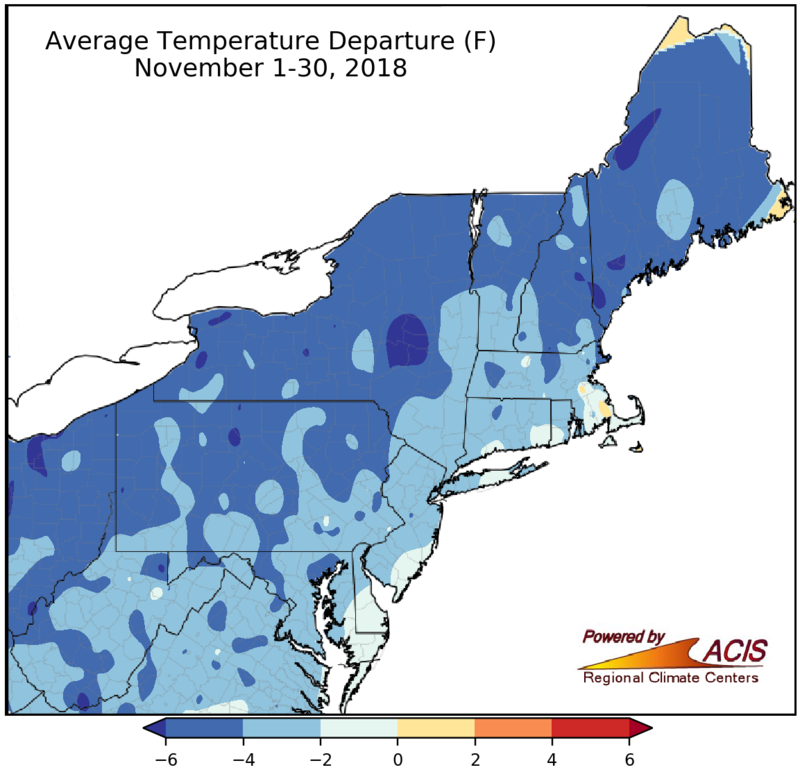 November was a colder-than-normal month in the Northeast, with average temperatures ranging from more than 6 °F below normal in parts of New York and Maine to near normal in a few coastal locations. All 35 major climate sites averaged a below-normal monthly temperature for the first time since April 2018. 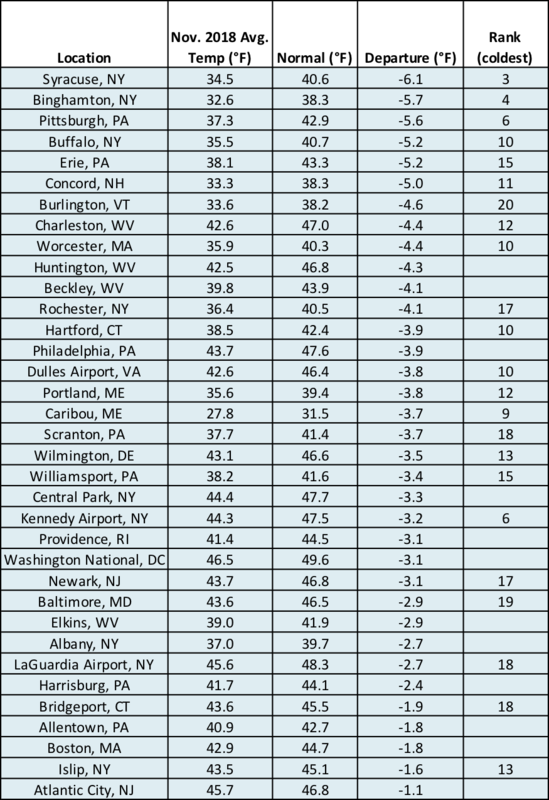 Twenty-three sites ranked this November among their 20 coldest on record. The Thanksgiving holiday was record cold! 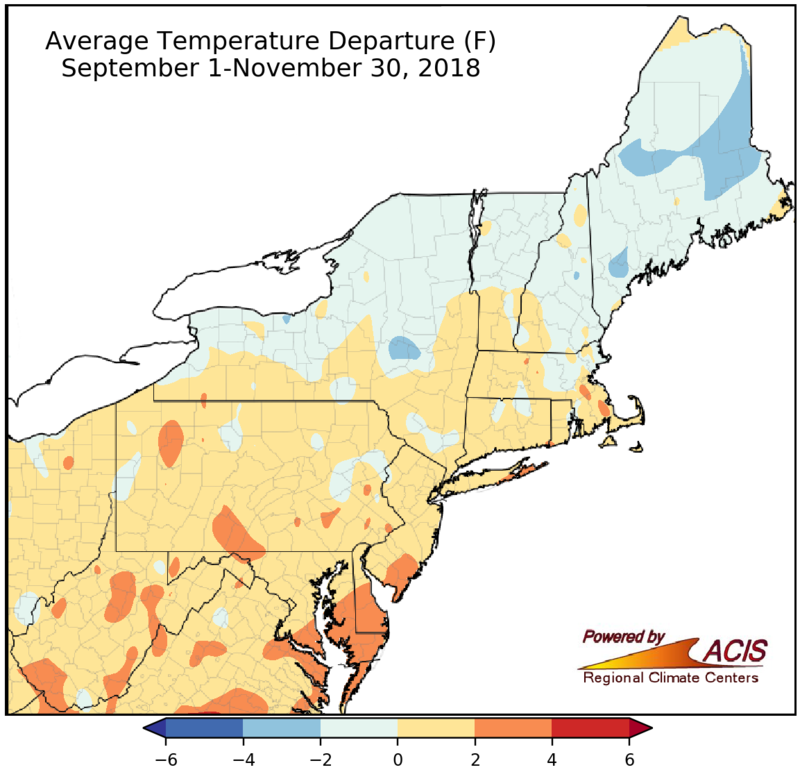 November average temperatures at the major climate sites ranged from 6.1°F below normal in Syracuse, NY, to 1.1°F below normal in Atlantic City, NJ. Autumn average temperatures ranged from 4°F below normal to 4°F above normal. The first half of autumn was warmer than normal, but the second half was colder than normal. With that, most areas averaged out to be within 2°F of normal for the season. There were a few colder spots up to 4°F below normal in Maine and New York and a few warmer spots up to 4°F above normal generally in southern parts of the region. Seven major climate sites ranked this autumn among their 20 warmest on record, while two sites ranked it among their 20 coldest. 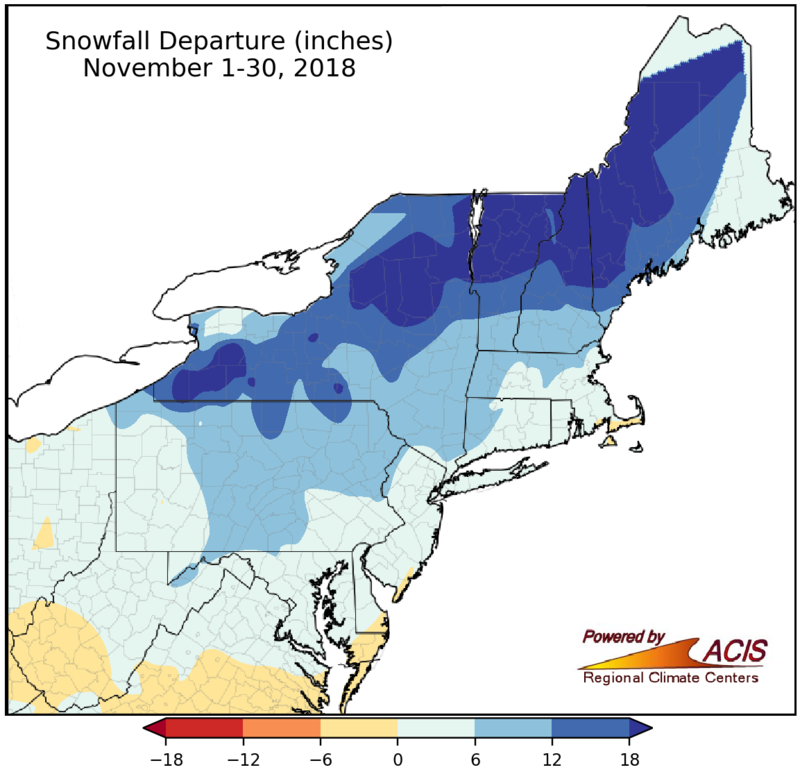 Autumn average temperatures for the 35 major climate sites ranged from 1.5°F below normal in Caribou, ME, to 2.8°F above normal in Allentown, PA.
November snowfall ranged from 6 inches below normal to more than 18 inches above normal. With cold conditions and an active weather pattern, it’s not surprising that November was also snowier than normal for much of the region. The snowiest spots were in New York and northern New England, which had a surplus of more than 18 inches. 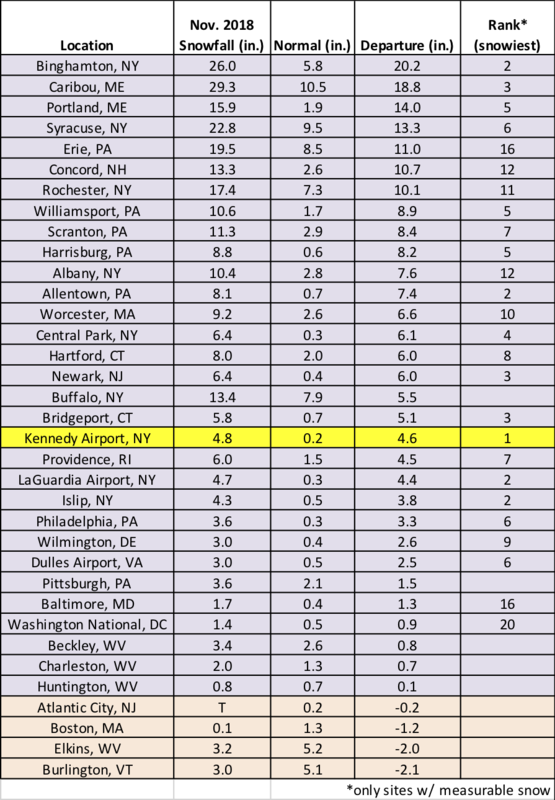 It was the snowiest November on record at Kennedy Airport, NY. And, another 25 sites ranked this November among their 20 snowiest. Some of the snow fell during a major early season storm mid-month. 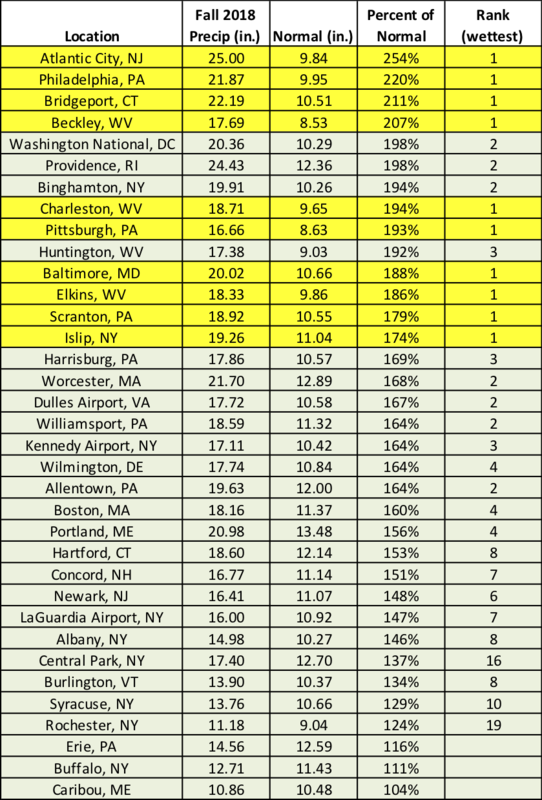 Newark, NJ, and Kennedy Airport, NY, had their greatest 1-day snowfall for November. For Central Park, NY, and Newark, it was the earliest 6+ inch snowstorm on record. The storm caused major travel disruptions. 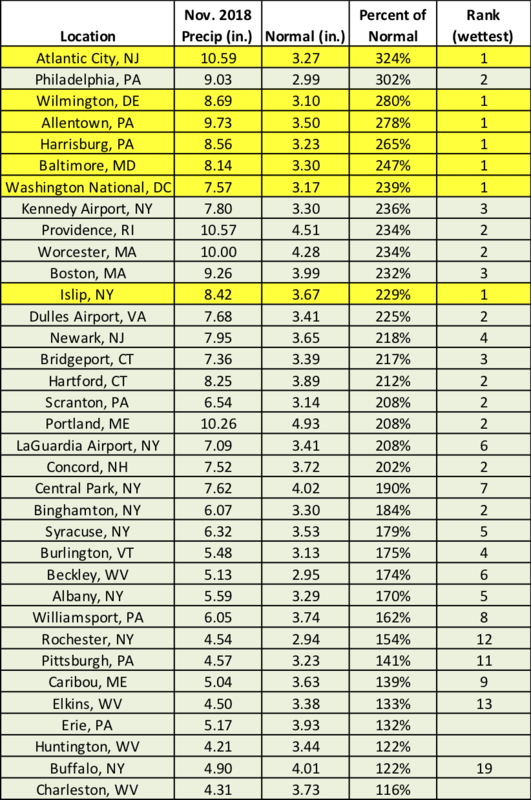 Kennedy Airport, NY, had its snowiest November on record. NOAA’s Climate Prediction Center (CPC) is forecasting an increased chance of below-normal temperatures for December for parts of northern New England. 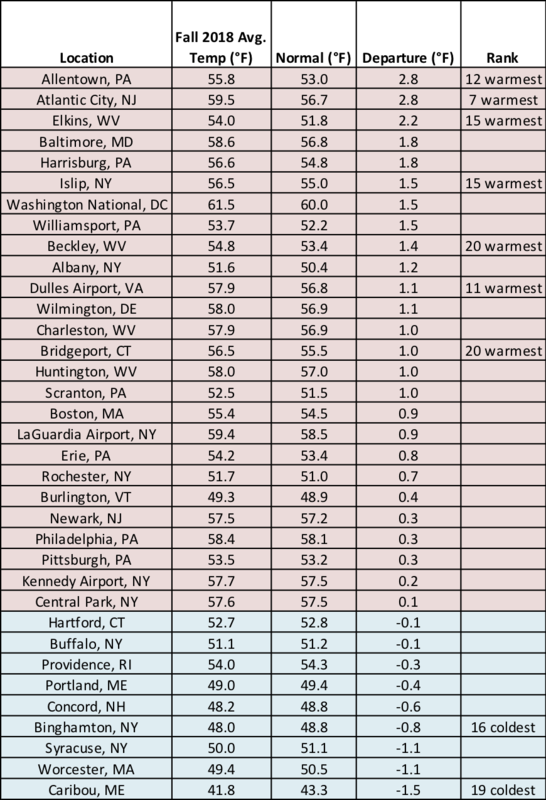 The rest of New England, as well as eastern New York, has equal chances of below-, near-, or above-normal temperatures. Elsewhere in Northeast, there’s an increased likelihood of above-normal temperatures. For precipitation, December is expected to be drier than normal for northern New England and northern New York and wetter than normal for parts of Maryland and Delaware. The rest of the region falls into the equal chances category. CPC’s temperature outlook for December. CPC’s precipitation outlook for December.